Background: Arterial stiffness, the expression of reduced arterial elasticity, is an effective predictor of cardiovascular disorders. Oxidative stress is an imbalance between exposure to toxic reactive oxygen species (ROS) and antioxidant systems. The increase in reactive nitrogen species (RNS) is termed nitrosative stress. Methodology: We review the main mechanisms and products linking arterial stiffness with oxidative and nitrosative stress in several disorders, focusing on recent experimental and clinical data, and the mechanisms explaining benefits of antioxidant therapy. 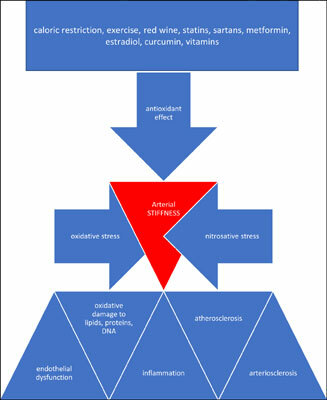 Oxidative and nitrosative stress play important roles in arterial stiffness elevation in several disorders, including diabetes mellitus, hypertension, metabolic syndrome, obesity, peripheral arterial disease, chronic obstructive pulmonary disease, systemic lupus erythematosus, thalassemia, Kawasaki disease and malignant disorders. Oxidative and nitrosative stress are responsible for endothelial dysfunction due to uncoupling of the nitric oxide synthase, oxidative damage to lipids, proteins and DNA in vascular endothelial cells, associated with inflammation, arteriosclerosis and atherosclerosis. Conclusion: Regular physical exercise, caloric restriction, red wine, statins, sartans, metformin, oestradiol, curcumin and combinations of antioxidant vitamins are therapeutic strategies that may decrease arterial stiffness and oxidative stress thus reducing the risk of cardiovascular events. ROS and RNS represent potential therapeutic targets for preventing progression of arterial stiffness. Keywords: Arterial stiffness, reactive nitrogen species, reactive oxygen species, nitrosative stress, oxidative stress. Keywords:Arterial stiffness, reactive nitrogen species, reactive oxygen species, nitrosative stress, oxidative stress. Abstract:Background: Arterial stiffness, the expression of reduced arterial elasticity, is an effective predictor of cardiovascular disorders. Oxidative stress is an imbalance between exposure to toxic reactive oxygen species (ROS) and antioxidant systems. The increase in reactive nitrogen species (RNS) is termed nitrosative stress.